The Military Airlift Commands VOLANT RODEO was always hard work and a lot of fun for all the folks involved. Once the team members were chosen, you'd practice and train for a couple of months prior to the event. Mostly you'd fly local airdrops and practice your engine running on/off load procedures (ERO's) till you were ready to pass out. One of the fun things we'd do would be a couple of off-station airdrops to different drop zones (DZ's). On these missions, we'd take all our maintenance folks along for a little fun. They'd work long and hard hours at home station getting the aircraft ready and these little TDY's was a fun time for them. What we'd do each year was go to Kelly AFB Texas and utilized some of the DZ's set up in that area the C-130 reserve unit used. One particular DZ was about fifty miles away and since we were only dropping bundles, it did not require two loadmasters and I elected to drive to the DZ and recover the SATB's (Standard Air Training Bundles) or bundles with several maintenance folks. We had gotten a six-pack truck from the motor pool at Kelly and were waiting at the DZ when the C-141 approached for it's first of four passes. We had been given the combination to the lock on the drop zone shack and had used the 'ice cream scooper' looking device to measure the wind velocity on the ground as well as the helium to fill a weather balloon and check the ceiling. It took us awhile to figure out the winds using the 'scooper'. Finally we figured it was between 1 and 20 knots. We took the middle road and passed on to the aircrew that the surface winds were 10 knots. Figuring out the ceiling required some math skills. Basically you'd release the helium filled weather balloon and knowing it would rise at a given feet-per-second rate, time it until it disappeared into the cloud base. Then you multiply the time it took by the constant number of the rising balloon speed. It was a nice clear day so the small balloon would disappear from view before it came close to any clouds. It took us about five balloons to figure out there wasn't any cloud base or the fact that we all had bad eyesight. While waiting on the aircraft to arrive overhead one of the maintenance guys decided to show us what happens when you inhale helium and did a couple of Mickey Mouse/Donald Duck imitations. The old ground to air radio we were using must have been one of the original radios invented by Marconi around the turn of the century. Basically the range was line of sight or maybe 8 to 10 miles but becoming real clear at about three miles. This meant that we could talk and understand each other about one minute out. The first four passes went well as they simulated heavy equipment drops from about 800-feet AGL (Above Ground Level) towards the green smoke canisters we'd pop prior to each pass. On the fourth pass we thought it would be fun to inhale some of the helium and pass on the drop information to the flight crew. I guess they were a little surprised to hear 'Donald Duck' give them the surface winds and ceiling one minute out on the radio and decided to make a fifth 'dry' pass. After witnessing four slow air-drop passes, we were surprised to see black smoke pouring out the rear of the PW TF-33's and their altitude seem to be somewhat lower as it streaked towards the DZ. Several of the maintenance decided it would be funny to 'moon' the aircrew. 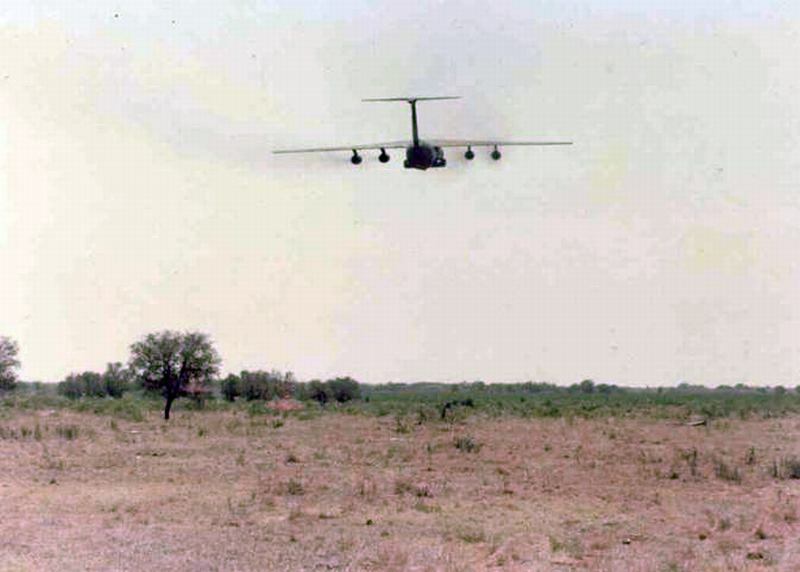 As the C-141 approached, they dropped their fatigue pants turned their backsides toward the fast approaching aircraft. 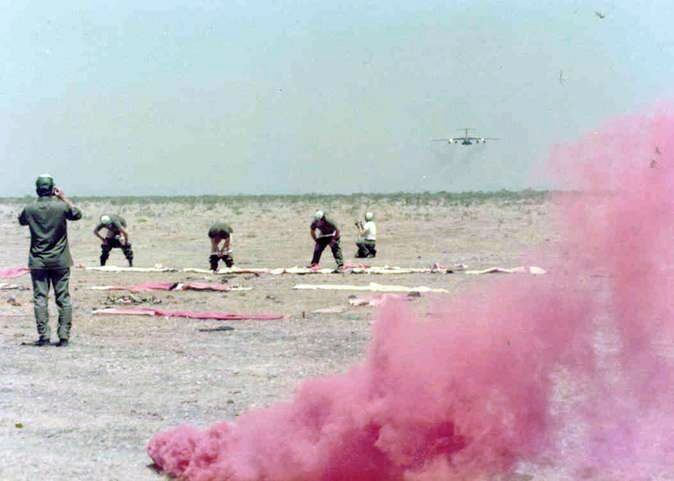 I popped a can of red smoke, tossed it on the DZ and snapped the below pictures as the guys 'mooned' the C-141. Later when I asked the AC his speed and altitude on the pass, he just grinned and said 300 knots and 300 feet. The Flight engineer later told me they 'exceeded one and were below the other' on the 300/300 question. Oh yeah, when the maintenance guys asked the pilots what it had looked like on that last pass one pilot just said, ' The guy on the end needs to have better personal hygiene'. Hopefully the statute of limitations has long since passed on these photos (over 20 years ago). To show you the quality of folks we used to have on those Rodeo teams back then, three of the guys in the first photo years later made CMSgt and the other two made it to SMSgt. And me .. I've been very fortunate to make it to CMSgt despite having entirely too much fun as a young airman and NCO.